Technical Laser Services in Rogers, Arkansas, uses precision machinery to offer the finest steel & aluminum fabrication in the industry. 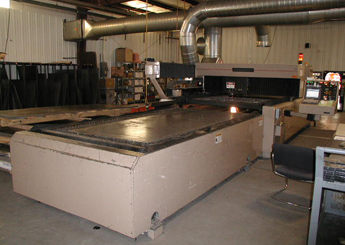 Our Co2 lasers, CNC Punch Press' and CNC Press Brakes are some of the most precise pieces of equipment in the business, allowing us to ship superior work and ensure customer satisfaction. Every part is inspected against specifications during setup to add to quality assurance. Using state-of-the-art Co2 lasers, we are able to offer the most versatile and accurate sheet metal cutting technology available on the market. In fact, our Co2 lasers are the most accurate in the entire world, providing cutting tolerances of 0.004 inches (0.102 millimeters) in a wide variety of materials, cutting through materials up to .625 inches (15.88 millimeters) thick. Our quality control system based on continuous improvement, our team of experienced professionals, and our internal production system allow for rapid turnaround on parts and prototypes with the highest standards of customer satisfaction. With quality assurance integrated throughout the production, we are able to deliver superior craftsmanship and on-time delivery. To complement our laser cutting capabilities, we have also integrated three innovative CNC punch presses capable of 900 hits per minute into our system. The hydraulic punching head can rotate 360 degrees, which can make any tool capable of punching at any angle. The CNC punch press also has automatic parts removal, making it among the fastest and most versatile punching machines available. We are able to quickly respond to "hot" orders or prototyping parts thanks to simple and quick machine setup from one program to the next. 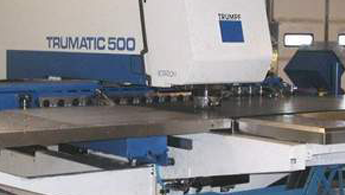 We use only high-precision Trumpf press brakes, each equipped with many features. To assure that every single angle is correct from the start, we can use Automatically Controlled Bending (ACB). ACB capable machines have angle sensors that measure and regulate the operation during the bending process. The system automatically compensates for the springback angle, which varies depending on the material, ensuring that every angle is correct from the start. • Press Force of 95-350 Tons • Large Bending Space • Bending Lengths up to 160"
Besides our CNC lasers, CNC punch press', and CNC press brake capabilities, we also have our own well-equipped welding department. We are capable of MIG and TIG welding on mild steel, aluminum, and stainless steel, as well as spot-welding on various materials.